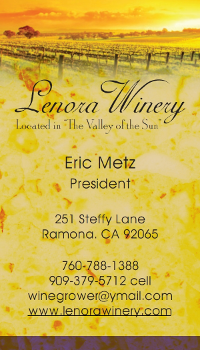 December 9, 2015 (Ramona)--The Ramona Valley Vineyard invites you to take a break from the holiday hustle and give yourself and and your friends a unique holiday wine experience. You can join Join 15 RVVA member wineries on December 12th & 13th for the second weekend of wine, fun and holiday spirits along the Holiday Wine Trail. Your “Get Your Merry On” Holiday Wine Trail Passport is your ticket to great deals and festive fun over all four days of the wine trail. 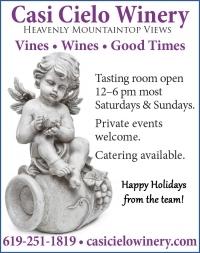 Each participating winery is offering different holiday wine trail specials including heavily discounted tastings and pairings, bottle and merchandise discounts, unique holiday gift items featuring local artisans. 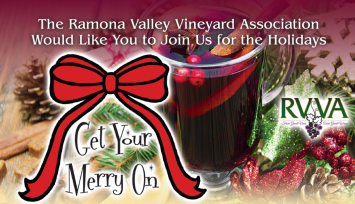 The Passport is $15/person* when purchased online at www.ramonavalleyvineyards.com/holidaywinetrail ($20/person at the door) and entitles the bearer to our special “Get Your Merry On” RVVA logo glass to enjoy your tastings in, as well as exclusive holiday wine trail special pricing and offers at all 15 participating wineries. 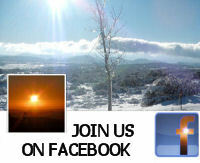 Vineyard Grant James: There will be music, hot spiced wine, delicious food pairings, discounted wine and local artists with unique holiday gifts.